The land speed record (or absolute land speed record) is the fastest speed achieved by any wheeled vehicle on land. There is no single body for validation and regulation; what is used in practice is the Category C ("Special Vehicles") flying start regulations, officiated by regional or national organizations under the auspices of the Fédération Internationale de l'Automobile. The record is standardized as the speed over a course of fixed length, averaged over two runs (commonly called "passes") in opposite directions within one hour. A new record mark must exceed the previous one by one percent to be validated. There are numerous other class records for cars, and motorcycles fall into another, separate, class. The first regulators were the Automobile Club de France, who proclaimed themselves arbiters of the record around 1902. Different clubs had different standards and did not always recognise the same world records until 1924, when Association International des Automobile Clubs Reconnus (AIACR) introduced new regulations: 2 passes averaged with a maximum 30min (later more) between runs, average gradient of the racing surface not over 1%, timing gear accurate within 0.01sec, and cars must be wheel-driven. National or regional auto clubs (such as AAA and SCTA) had to be AIACR members to ensure records would be recognized. The AIACR became the FIA in 1947. Craig Breedlove's mark of 408.312 miles per hour (657.114 km/h), set in Spirit of America in September 1963, was initially considered unofficial. The vehicle breached the FIA regulations on two grounds: it had only three wheels, and it was not wheel-driven , since its jet engine did not supply power to its axles. Some time later, the Fédération Internationale de Motocyclisme created a non-wheel-driven category, and ratified Spirit of America 's time for this mark. On July 27 1964, Donald Campbell's Bluebird CN7 posted a time of 403.10 miles per hour (648.73 km/h) on Lake Eyre, Australia. This became the official FIA LSR, although Campbell was disappointed not to have beaten Breedlove's time. In October, several four-wheel jet-cars surpassed the 1963 mark, but were eligible for neither the FIA nor FIM ratification. The confusion of having three different LSRs lasted until December 11, 1964, when the FIA and FIM met in Paris and agreed to recognize as an absolute LSR the higher speed recorded by either body, by any vehicles running on wheels, whether wheel-driven or not. Thus, Art Arfons' Green Monster was belatedly recognised as the absolute LSR holder, while Bluebird held the now-separate wheel-driven land speed record, and Spirit of America the tricycle record. Since then, no wheel-driven car has held the absolute record. A record established on a permanent or temporary track approved by the ASN whatever the nationality of the competitor. A record established or broken in conformity with the rules established by an ASN on its territory or on the territory of another ASN with the prior authorisation of the latter. A national record is said to be a class record if it is the best result obtained in one of the classes into which the types of cars eligible for the attempt are subdivided, or an absolute record if it is the best result, not taking the classes into account. By International record is meant the best performance accomplished in a determined class or group. There are international records for automobiles, special vehicles and ground effect vehicles. A record recognised by the FIA as the best performance achieved by an automobile irrespective of category, of class, of group, or any other means of subdivision. ^ "FIA land speed records", FIA, http://www.fia.com/en-GB/sport/records/Pages/Introduction.aspx, retrieved on 2008-10-16. ^ "§105. Conditions for the recognition of international or world records", Sporting Code: Chapter 7: Records, FIA, http://www.fia.com/sport/Regulations/Common/sporting_code/chapter07.html, retrieved on 2008-10-16. ^ Northey, Tom (1974). "Land Speed Record: The Fastest Men on Earth". in Tom Northey. World of Automobiles. Vol. 10. London: Orbis. p. 1162. ^ Martin, James A.; Thomas F. Saal (2004). "Ch 17: Land Speed Record to 1939". American Auto Racing: The Milestones and Personalities of a Century of Speed. McFarland. pp. 39. ISBN 0786412356. ^ a b c Northey, p.1163. ^ a b c d Northey, p.1164. ^ a b Northey, p.1166. 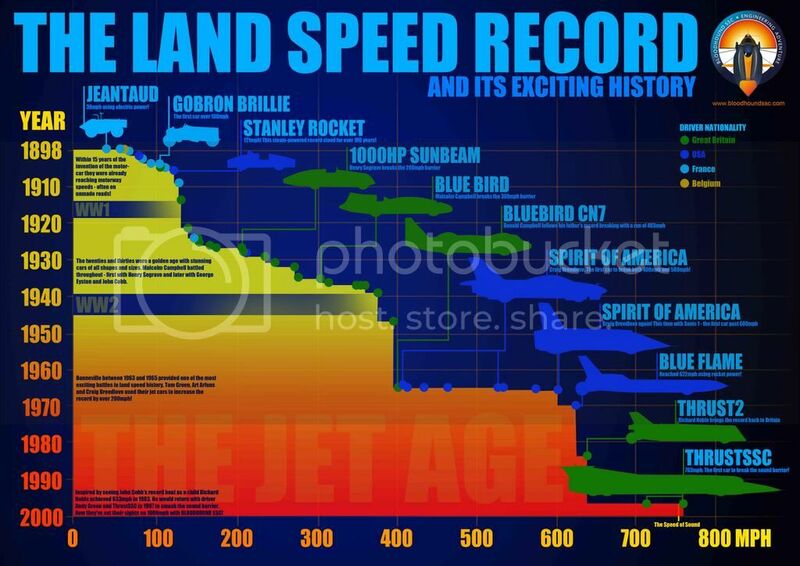 ^ "Land Speed Record", speedrecordclub.com, http://www.speedrecordclub.com/outland.php, retrieved on 2008-08-02. ^ "from our motoring correspondent" (December 12, 1964), "Land Speed Record Agreement", The Times (Issue 56193): p. 7, col E.